We have a number of very good new vendors at the Downtown Glendale Market. One of those is Mom’s Products, Inc. It began nearly 20 years ago out of the home of owner, Ben Azouz. He started making his authentic Mediterranean dips and appetizers for his friends and neighbors. His products were so popular, he began selling them in farmer’s markets. Today you can buy his products at over 30 markets, from San Diego to Orange County. 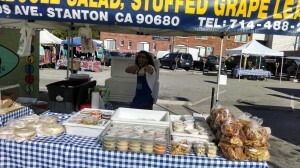 Be sure to try the number one seller and favorite of employee, Mosstafa Bibi (pictured here) the artichoke hummus. The market is open every Thursday from 9 a.m. to 1:30 p.m. in the parking lot of the First Baptist Church behind the Alex Theatre.